Seven has locked its two Anh Does Italy specials into next week, airing 7:30pm Tuesday July 21 and 8pm Thursday July 23rd. They are the latest travel adventures for the loveable Do who has previously traversed Vietnam, the UK and Scandinavia. “I’m visiting a country that prides itself on its art, architecture, food and sense of style. People here have a simple motto – la vita e bella, life is beautiful,” he says. As tipped, Seven is launching Dancing with the Stars this Sunday but is yet to confirm its House Rules finale. And Anh is on a special quest to not only see the country, but experience that motto first-hand. From the German-speaking slap-dancers of Tyrol in the Alps to the pasta nonnas of Bari in the south, Anh tastes the best Italy has to offer. In Venice he becomes a Gondolier; in Verona he is enthralled by the eternal romance of Romeo and Juliet. He test drives a hand-made Lamborghini, takes on a couple of centurions in a chariot race, then settles on a manic Segway tour of Rome. He climbs into the crater of Mt Vesuvius to make sure everything is ok and cooks a chicken dinner in the volcanic sands of Ischia. He swaps the Segway for a thrilling Vespa tour of the Amalfi Coast ending in the most delicious lunch with the most magnificent views imaginable. 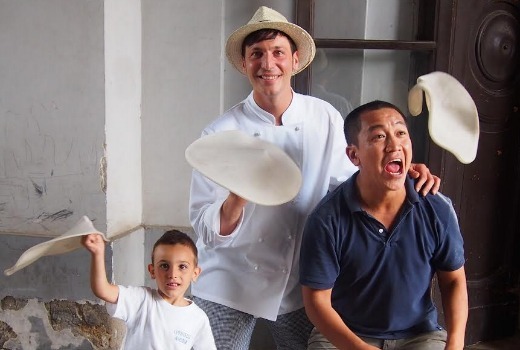 Everywhere Anh goes he meets the people and tastes the food that makes Italy an adventure not to be missed. Anh Does Italy is the latest in a series of Anh Do specials produced in-house by Seven Productions. Paul Melville is Director and Executive Producer.